Continuously improving your ability to diagnose accurately and efficiently, Welch Allyn presents the macro view ototscope head, model 23810/23820. This amazing new instrument is the next generation in otoscopes. 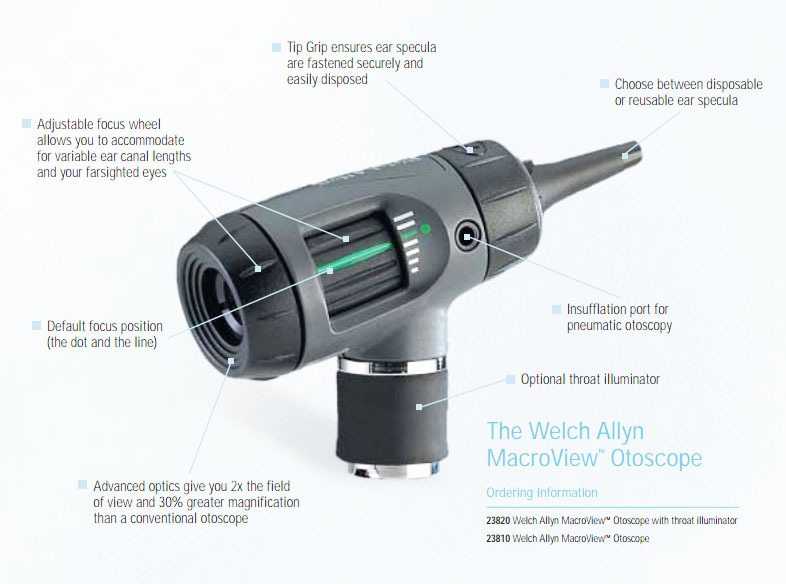 Featuring advanced optics that provide 30% more magnification than traditional scopes, which allows you an almost full view of the tympanic membrane and drastically increases clarity and definition of landmarks, this otoscope will enhance your ability to perform fast and efficient examinations and improve your accuracy in diagnosis. The easy focus eye piece gives you nearly twice the field of view, while allowing you to adjust for differing ear canal lengths or your own far sightedness. Our enhanced optics means you probably don’t need your own glasses while performing exams since this unit is already correcting for any of your visual deficiency. With the enhanced visualization you experience, you’ll be able to see past wax and determine if there is fluid behind the eardrum. The fiber optic technology provides cool light with no reflections or obstructions. We’ve also improved some mechanical features, including the addition of our special tip grip that ensures your specula is fastened securely and it makes it easier to remove as well. As with all of our models, Welch Allyn 23810 comes complete with an insufflators port for pneumatic otoscopy. On top of all these amazing benefits, this model comes with a one year warranty. When you want to provide your patients with the best exam and thereby, diagnostic excellence, the Welchy Allyn model 2380/23820 is the otoscope to use.